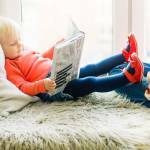 Is your child starting school or daycare soon? 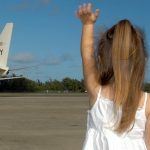 As many of us may have experienced, this time of transition can really impact a child’s health and wellbeing, so we hope the following information offers some key insights in helping keep your kids healthy when starting school or daycare. 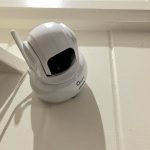 This article is kindly sponsored by Flo, winners of the Tell Me Baby 2018 Best Baby Healthcare product. The bane of many parents’ lives is when their little one gets a cold. In the early years, there seems to be a relentless reoccurrence of them. 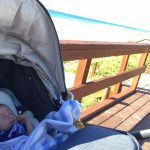 And even in the warmer, summer months, when most children start school or day care, this too can be a period of snotty noses and sneezes within many families. So, what’s the deal with these constant colds? Colds are a regular occurrence in babies and young children because they’re just starting to build up their immunity. 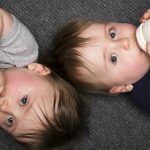 It might feel like your child is constantly sick or that their cold seems to hang around forever, but be reassured this is quite normal in very young kids. Still, for many parents, knowing when to take your child to a GP or not, can be tricky. Parents sometimes take their children for treatment of a cough or cold expecting an antibiotic prescription. Antibiotics shouldn’t be prescribed in the case of colds and viral infections because they are ineffective because they are used to kill bacteria and not viruses. 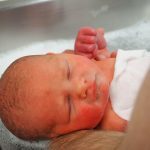 If your child shows other symptoms other than a snotty nose, such as a temperature, fever, loss of appetite and/or is very unsettled then it’s a good time to see your GP. If they seem to be sporting a constant runny or blocked nose, it might not be a cold – it might be an allergy, such as hay fever. Colds and allergies (e.g. hay fever) have similar symptoms and it can be hard to tell the difference, especially as colds in children tend to linger or return quickly after an initial cold. 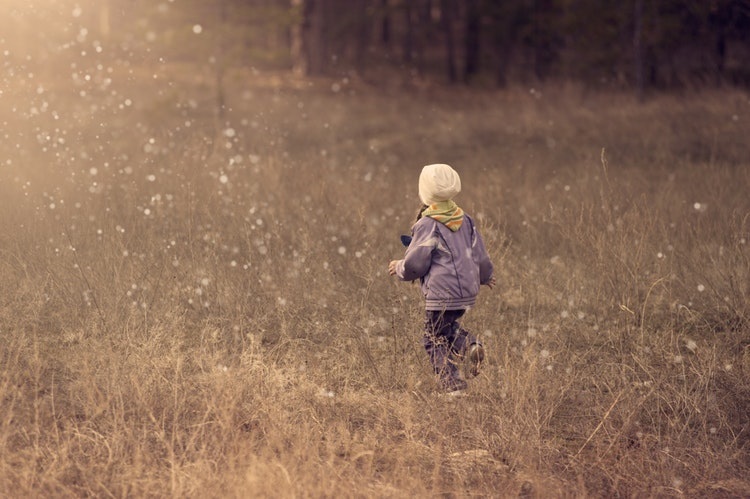 Some children may experience hay fever at certain times of the year (e.g. spring or summer) and others experience them all year round. Common allergens include pollen, pet hair, dust, mould or more. 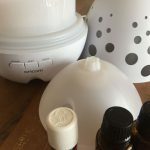 In the warmer months, allergens such as mould, summer grass pollens and pollutants may be the triggers of a person’s allergies. At school or childcare, your child may be exposed to dry, windy playgrounds and pollen in the air. If their school is in a built-up area, then pollutants could pose a problem. And with warmer temperature and higher humidity, there’s the issue of increased mould spores3 which are not particularly easy to identify in the home or at school or childcare. If your child is suffering from some of the following symptoms, she/he may have an allergy and should see your GP. 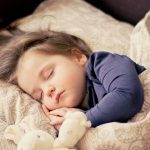 A more recent study has also shown that night time bed wetting is common in children with allergic rhinitis, particularly in young boys4. There is a wide range of different options to help relieve hayfever symptoms but sound medical professional advice is key because treatment depends on many factors including age and severity and frequency of hay fever symptoms. For more information, visit Asthma Australia’s website. How can a cold or allergy impact sleep? Infants up to the age of two months are obligate nose breathers5. This means that when their nose is blocked, they do not instinctively know to breathe through their mouth which, can result in disrupted sleep. 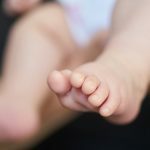 Whether a baby is bottle fed or breastfed, a blocked or congested nose may also interfere with feeding as breathing through the nose may be very difficult during suckling. 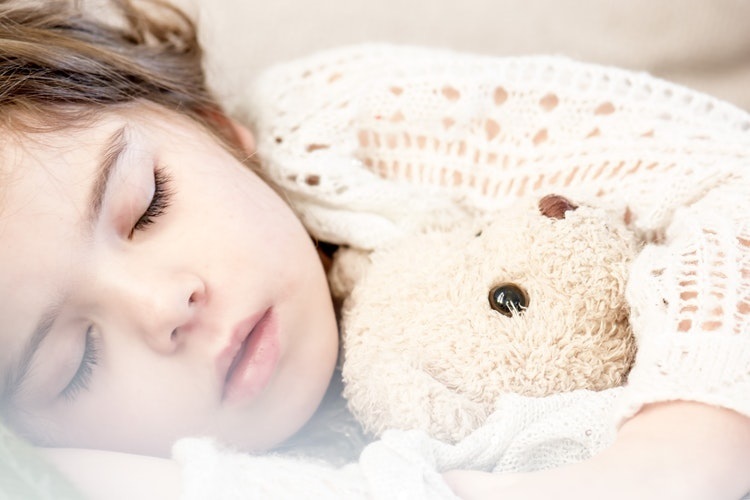 Toddlers and young children may also wake frequently during the night due to the discomfort of a blocked, itchy or runny nose. 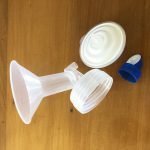 For newborns, infants and children, a simple nasal saline, preferably one that can be used daily, without any preservatives, can be very useful in tackling a congested nose from a cold or allergy. A nasal saline can help thin mucus, wash away allergens and germs and as a result, help your child breathe easier6. 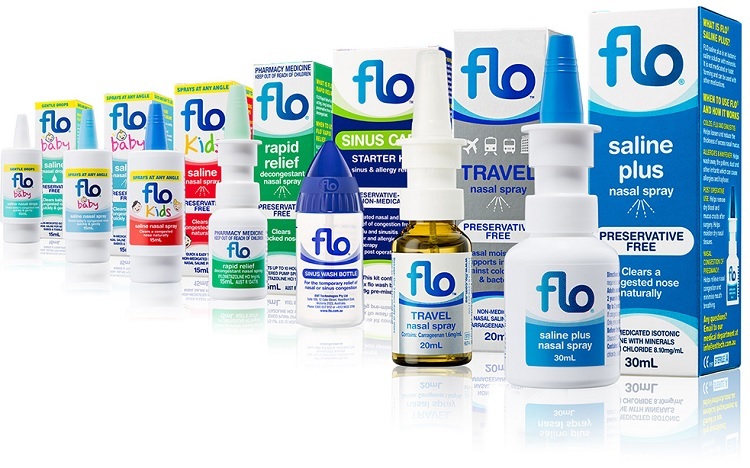 Whether you or your child has a cold or an allergy, Flo’s extensive family range of preservative-free products can help relieve symptoms of either. 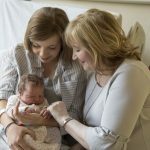 There’s a product for every age in the family including Flo Baby Saline Drops or Spray, Flo Kids Saline Spray, Flo Saline Plus and Flo Sinus Care. 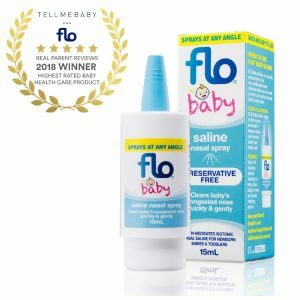 Flo Baby Saline Spray was recently awarded the best baby healthcare product by TMB Members. 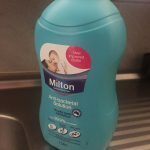 Parents love how effective it is but also how easy is to use, as it can be sprayed at any angle. 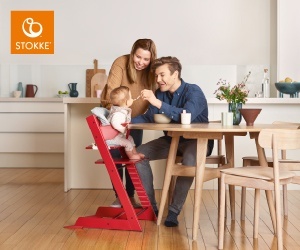 This means that using it on the wriggliest of babies is a breeze! Flo spray products can easily be popped into a school or daycare bag too so that your child can get some relief from a runny, itchy or blocked nose even when they away from home. Always read the label. Use as instructed. If symptoms persist, talk to your healthcare professional. Don’t forget that along with regular nasal washing with saline, regular hand-washing is also important for both adults and little ones, to prevent the spread of germs. For more helpful cold hacks for all the family visit here. Here’s wishing both you and your child a smoother, healthier transition to school or daycare this summer! 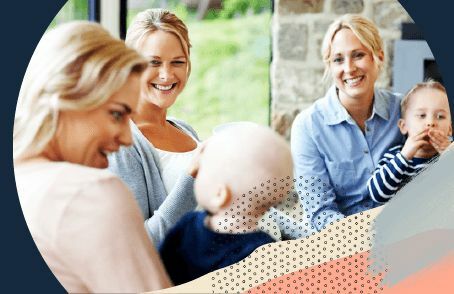 Find out more about the Flo range here and read reviews from Australian parents on Flo products here. 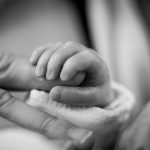 Flo advises that if your child shows signs of fever or illness and is not settling, please talk to your healthcare professional. Winner will be announced here sooon! 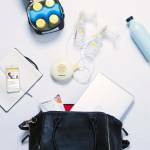 Would you like to win a healthy back to school pack for your child? Entries close at 11.59pm on January 23rd 2019 and the winner will be announced in our newsletter, so make sure you’re signed up here. These terms and conditions of entry, including information on how to participate and prize details (Terms), apply to the promotion and entry into the promotion is deemed acceptance of these Terms. The promoter is Tell Me Baby. ABN 25 155 148 093.
c) persons who have breached the terms and conditions of any promotion run by or on behalf of the Promoter, (Eligible Entrants). The persons referred to in paragraph 3(b) of these Terms includes natural and non-natural relations (in the opinion of the Promoter) and the Promoter is responsible for determining whether a person is an Eligible Entrant in its absolute discretion. The Promotion ends at 11:59pm January 23rd 2019. 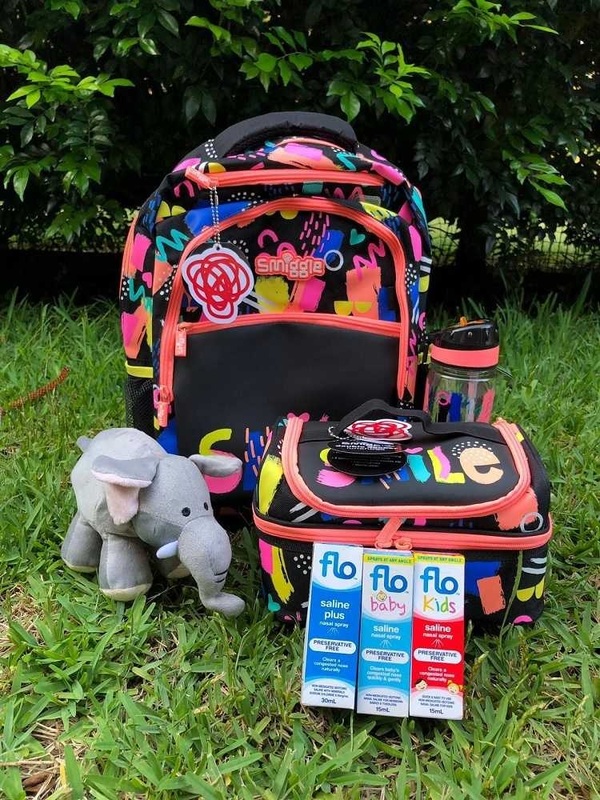 Prize includes: 1 x Flo Saline Plus, 1 x Flo Kids Saline Spray, 1 x Flo Baby Saline Spray, 1 x soft Flo elephant, 1 x Smiggle Back Pack, 1 x Smiggle Lunch Bag and 1 x Smiggle Drink Bottle. Cost of delivery will be at the expense of Tell Me Baby. Incomplete entries or those that contain defamatory comments are ineligible to win. Eligible Entrants may only enter once and in their own name. The winning Eligible Entry/Entries will be chosen by a selection panel based on the entrant’s creativity and skill. The judges’ decisions are final and no correspondence will be entered in to. If an Eligible Entrant wins a prize, they must be a Subscriber at the time of it being awarded. Winners will be notified by email and their name will be published on the Entry Page within a day of winning. The Promoter will do its best to contact the winner/s. If a winner does not accept their prize within one month of being chosen, the Promoter will select the next best Eligible Entry/Entries. The Promoter reserves the right to select alternate winner/s if it determines in its sole discretion that the winner/s do not adequately satisfy these terms and conditions. Prizes are not transferable and not redeemable for cash. The prize winner is responsible for any expenses, fees and costs connected with the prizes that are not included in the prize descriptions. The prize(s) will be delivered to the residential address as provided by the winner(s) by the prize supplier. The Promoter conducts this Promotion on behalf of the prize supplier and is not responsible for any loss, damage or delivery of the prize once the prize supplier has been provided with the winner’s details. The Promoter and their promotional partners are not responsible for any loss or damage in relation to the prize once it has been awarded. Any Eligible Entrant who, in the opinion of the Promoter, tampers or interferes with the entry mechanism in any way, engages in any unlawful or improper conduct which jeopardises or is likely to jeopardise the fair or proper conduct of the Promotion, or who does not properly comply with the entry process, will be ineligible to receive a prize or enter further promotions run by the Promoter. All entries become the property of the Promoter. Once submitted, your entry will not be returned to you. By entering the promotion, Eligible Entrants acknowledge that the Promoter is granted a worldwide, non-exclusive, irrevocable licence in perpetuity to reproduce, publish, adapt, communicate and broadcast all or part of their entry in any media for the purposes of this competition and inclusion in the Promoters products and marketing materials. The Promoter and its promotional partners will use the personal information contained in your entry to conduct the promotion, and award the prize. If you win a prize, the Promoter can use your name to credit you for your entry and for marketing purposes. This promotion is in no way sponsored, endorsed or administered by, or associated with, Facebook, Instagram, Twitter or Pinterest. We hereby release Facebook, Instagram, Twitter or Pinterest of any liability. You understand that you are providing your information to Tell Me Baby and not to Facebook.